If you are looking for advice on how to create a charity website to increase donations then this guide to the best online fundraising platforms, site builders and best practices should help you. A charity website is the easiest and most efficient way of increasing awareness about your cause. Online fundraising raised $23 billion in the US alone in 2016. But whether you’re looking to help out children in need, protect abandoned animals, or give a second chance to those who’ve lost hope, you’ll need a robust website to attract online donors and volunteers. Building your nonprofit website is easier than you might think. With the right tools, you can have a rough version ready in a couple of hours, without blowing your budget. This is the part that scares most people who don’t have web design skills. Luckily, though, you don’t need to know anything about programming to start a charity website. But, you will need to set a budget for building and maintaining your site right from the start. When looking to increase donations, consider investing in secure solutions for collecting money and personal data. You need a practical name so that people can find you easily online. Try to choose an address that’s similar to your charity name, to make sure people know exactly who they’re donating to. Most nonprofit organisations use the ‘.org’ extension for their websites. But, you can choose from a wide range of domains and find the one that best suits your needs. If the domain name you want is already taken, try to add ‘charity’ at the end, to find an available address. There’s plenty of online tools to build your website within hours. To start with, you’ll need a hosting provider and a platform. Charity Checkout Websites – As specialists in charity websites, this company can build you a site with generating both awareness and online donations in mind from the outset. The websites are mobile friendly, easy to manage, and can be paid for either monthly or with a low annual fee. There is no charge for set-up. BT Community Web Kit is a free service, specially created to help charities and nonprofit organisations. Wix is a free tool that allows you to build good websites. You receive an intuitive editor, secure hosting, a mobile website and 500MB of storage. Yet, the free version has limitations, so you may be pushed into trying one of the premium plans as your charity grows. You can also use WordPress, which is the most famous platform for websites and blogs. It’s not made for charity, but it’s easy, responsive and flexible. If you have some budget, think about hiring a web designer, who can help you choose the best hosting and build you a unique website – or go with a provider of a complete solution for the website and fundraising platform combined. You need to make sure that your website is useful and easy to follow, if you want to increase online donations. Your website should engage visitors in your cause. Interesting content and smart donation tools should guide your visitors from your landing page to the ‘Donate’ button. Use simple words to explain all the important details about your mission: what you want to do and how your cause makes the world a better place. People like numbers and stories. So, provide measurable information to demonstrate your impact. Then talk about the people you help. Use photos and videos to illustrate facts and make visitors feel as if they’re part of your mission. Donors want to know how their contribution can help your cause. So, be sure to tell them how their money is spent. Give details about programmes, events or initiatives your charity organises. Describe how these influence your mission and what good comes out of every activity you get involved in. Donors want to know that their money ends up in the right place. So, you’ll need to prove your credibility. Make sure your landing page has testimonials, watchdog ratings and endorsements, if possible. This way, people can see that you’re honest and won’t hesitate in supporting your cause. 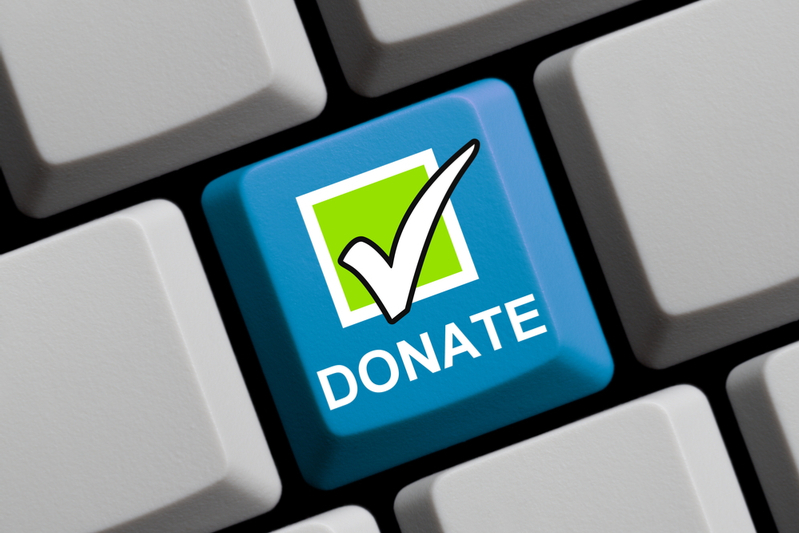 An easy-to-use donation tool is essential when building a charity website. Your visitors must be able to support your cause with as little effort as possible. If it takes them 10 minutes to donate, you’ll risk losing them. Give – Great, if you have a WordPress website. It helps you manage donation forms, donor history and reports. PayPal Donations – Good reputation in online payment. It has discounts for registered charities and donors don’t need a PayPal account. Qgiv – Allows any type of online donation. You can choose from four different pricing plans, depending on your needs. Charity Checkout – a leading all-in-one solution for charities. The company can help you to set up a new website that includes a donation system or integrate an easy to use fundraising platform within your existing website. As well as options to donate cash, make sure your website also tells people about alternatives to donations. Your goal is to raise more money, but people can engage with your charity in many other ways. Volunteering, sharing your website on social media, or simply recommending your charity to family and friends will all help increase awareness. Let visitors know their engagement matters. Even if they can’t donate at the moment, as your website receives greater recognition, they may be instrumental in the future growth of your charity.